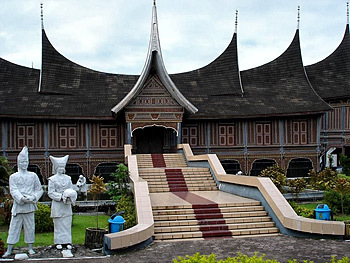 The capital of West Sumatra, Padang has several houses built in traditional architecture, including Padang Museum, which houses objects of cultural and historical interest. The beach of Bungus bay and its white sands is good for swimming, boating or just watching the fishing boats going out to sea in the afternoon. Small boats can be hired from here to some small islands nearby: Sirandah, Sikoaci Pagang, Parsumpahan.